AS WE FACE THE EVER-CHANGING ECONOMIC LANDSCAPE OF THESE MODERN TIMES, business leaders and executives need more than basic leadership and success principles to continuously grow and succeed in their enterprises. 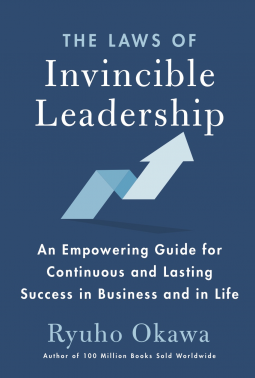 The Laws of Invincible Leadership was compiled to offer the success mentality and perspectives that led Ryuho Okawa himself to successfully develop his own organization from the ground up, even while facing difficult economic and social times. In this book, Okawa shares essential principles for all who wish to　become invincible managers and leaders in their fields of work, organizations, societies, and nations. Let Okawa’s breakthrough management philosophy in this empowering guide help you find the seeds of your future success. Your keys to becoming an invincible, overall winner in life and in business are just pages away. ・Giveaways on business radio stations in the top 50 markets including Bloomberg Radio affiliates. ・10-City Business, Spiritual and Self-Help Podcast tour. ・Pitch feature stories to over 100 spiritual and 100 business, career and self-help sites including belief.net, Huffington Post, success.com, forbes.com, fastcompany.com, inc.com, and Boardroom Publications. ・Contribute content to the major business social media sites. ・Author stock articles for American City Business Journals. ・Online Ads in top self-help, spiritual and business sites and social media platforms. ・Local US Spokespeople to author articles in local business journals and blogs highlighting themes from the book. ・Ongoing promotion on OkawaBooks.com website and multiple Happy Science Facebook Platforms and Twitter that have over 50,000 followers and growing. ・Pitch book reviews, features, mentions and author pieces to over 300 newspaper, magazine, wire service and business columnists in the spiritual, self-help and business space including the magazines (Mindful, Spirituality & Health, Forbes, Fast Company and Inc.). ・Ad placement in Success, Forbes, Inc., Fast Company, Spirituality and Health, Mindful and Live Happy Magazine. ・Local US Spokespeople to author articles in spiritual and local business publications highlighting themes from the book. ・ Pitch Publisher’s Weekly, Booklist and Kirkus to review and PW on a IRH Press USA expansion feature into the business niche. ・US Spokespeople in New York, New Jersey, Los Angeles, San Diego, San Francisco, Atlanta and Tampa will be pitched to do local television interviews on network affiliates and local cable access. ・ National pitches to Fox Business, CNBC-TV and Bloomberg Television. ・Seminars on “The Laws of Invincible Leadership” to promote the book sales in local stores in major cities in the United States and Canada (New York, New Jersey, Los Angeles, San Francisco, Atlanta, Tampa, and Toronto). ・Pitch local TV, radio, Newspaper and Online media as well as local Japanese American publications to support independent bookstore sales in New York, Los Angeles, and San Francisco. ・Co-op money available for Chain, Independent and Online in-store promotions. This book provides insights and strategies that inform successful thinking and inspires you to look beyond your weaknesses and strengths. I found chapter Four: Get Support from others timely because it's the one thing I struggle with and his examples of the musician's art and workplace productivity were key in highlighting the importance of teamwork. Inasmuch as I read this book in three days, I believe as a guide it's best read a chapter or two a day, or you can select a chapter to read based on what you are grappling with. Thank you NetGalley for the arc.